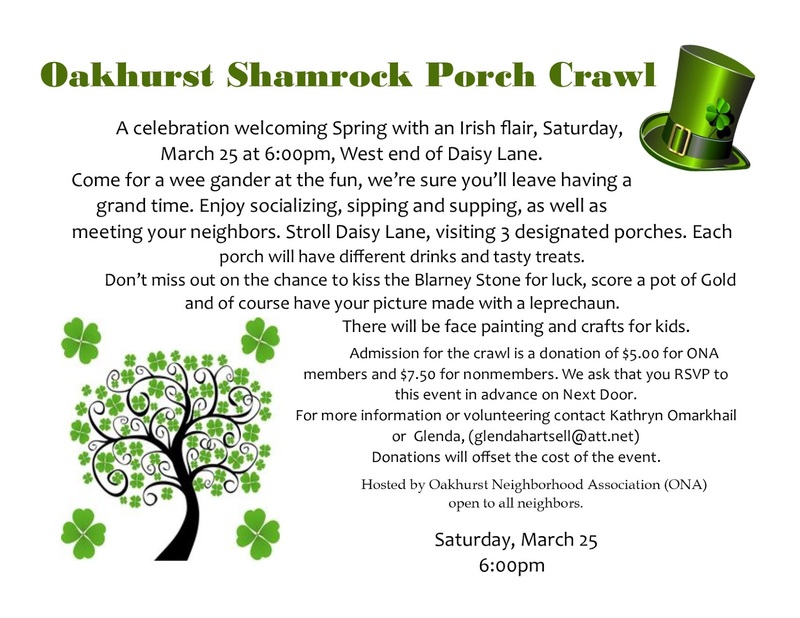 Oakhurst Neighborhood Association, Fort Worth, Texas: Mark Your Calendar: Oakhurst "Shamrock" Porch Crawl! 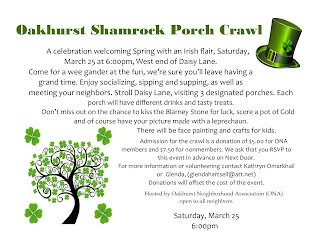 Mark Your Calendar: Oakhurst "Shamrock" Porch Crawl! Join us for a celebration welcoming Spring with an Irish flair, Saturday, March 25 at 6:00 pm, starting at the west end of Daisy Lane! Come for a wee gander at the fun; we're sure you'll leave having a grand time. Enjoy socializing, sipping and supping, as well as meeting your neighbors. Stroll Daisy Lane, visiting three designated porches. Each porch will have different drinks and tasty treats. Don't miss out on the chance to kiss the Blarney Stone for luck, score a pot of Gold and (of course) have your picture made with a leprechaun. There will be face painting and crafts for kids. The crawl is being hosted by Oakhurst Neighborhood Association (ONA) and will be open to all neighbors! Admission is a donation of $5 for ONA members and $7.50 for nonmembers; donations will help offset the cost of the event. We ask that you RSVP to this event in advance on Nextdoor. For more information or volunteering, contact Kathryn Omarkhail or Glenda (glendahartsell@att.net). We also have some local businesses near Oakhusrt that will be participating in the Porch Crawl such Martin House Brewery located just down the street from us and The Tributary Cafe on Race which is owned by an Oakhurst resident.